The Punjabi people are forever linked to the influence of Sikhism. The Punjabi language was actually derived from the 10 Sikh gurus of Sikhism. Punjabi men wear salwar kamiz or shalwars which is a long tunic and wide trousers. The colors of the shalwar and tunic are important to Punjabi. They usually match and are color coordinated to a certain degree. 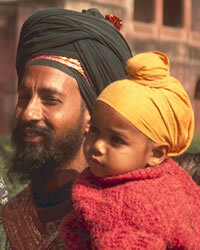 The men also wear turbans on their head. Men should not make direct eye contact or touch women in this culture. This communicates disrespect and impure intentions with that woman. Men also should not give gifts directly to a woman. When visiting a house, if a man giving a gift to a woman should state it is from another woman, such as one's wife. The word ‘Sikh’ is derived from the Sanskrit word ‘Shishya’ which means disciple. They believe that the gurus are God’s messengers and directed by Him. They word in a Gurdwara which is a Punjabi word that means “Gateway to the Guru”. Pray God will working in the lives of Punjabi people to understand and receive the message of God's free gift of salvation. Pray Christians will take the initiative to form relationships with Punjabi sharing the message of Christ through their lifestyle and word.